I love going through old pictures. Even way back when of travels I can only just remember – it’s always so fascinating to know you’ve seen amazing places through such young eyes. 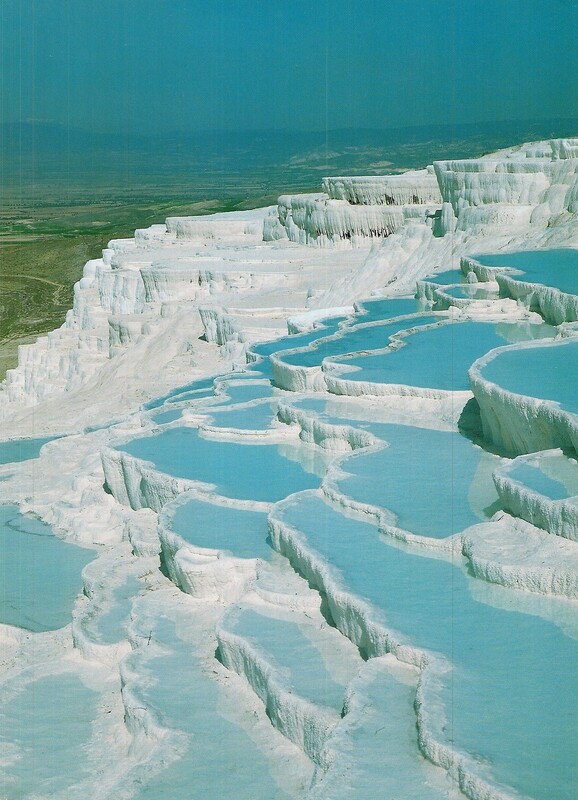 Last time I gave you the Pyramids of Egypt, and this time it’s an equally unique site in southwest Turkey: Pamukkale, the travertine hot springs. A UNESCO World Heritage Site don’tcha know. 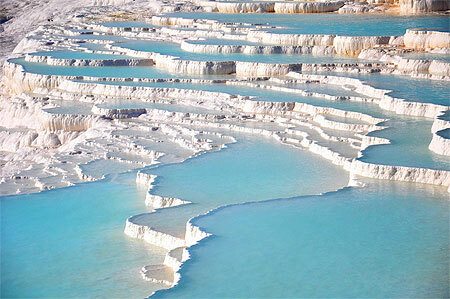 Fun fact: Pamukkale in Turkish means “cotton castle”. You can see why: the overlapping terraced springs along the hillside are pure white. They look like they’re in their own never ending winter – like snow dripping over each terrace with a gentle blue icy glaze over the surface. Because these are hot springs (contradictory to the icey cold imagery! ), steam drifts up and hovers – I like to think this is one of the reasons it was given its “cotton” name. What intrigues me about Pamukkale is the stark difference between the springs and the rest of the landscape you see in the background (especially in my own photo below). It’s caused by the creamy, white colour of the sedimentary rock travertine (a form of limestone), and it’s just so brilliantly out of place. When I was going through my photos, unfortunately there wasn’t one where I wasn’t naked. Now don’t be alarmed, I was 4 years old – of a regrettably acceptable age to frolick around unclothed. To keep my younger self’s dignity intact, I have altered the image below: I am now a hula skirt, coconut-wearing 4 year old frolicking in Turkey. You are welcome. 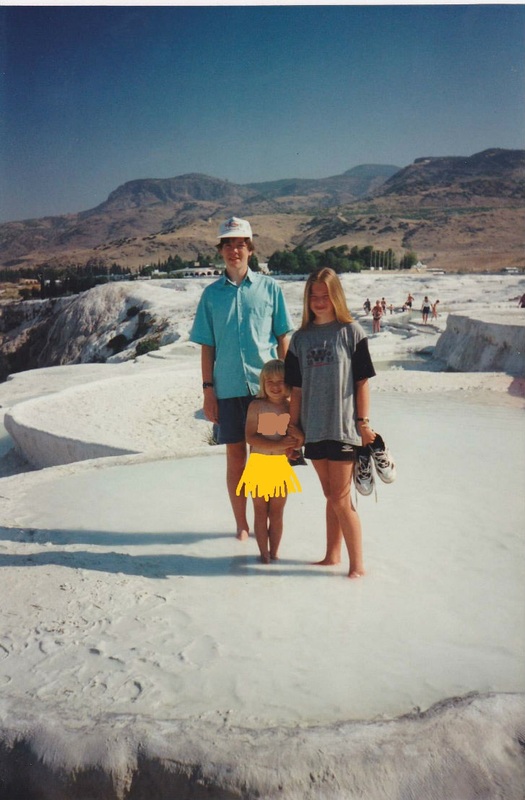 Cute photo :) I just visited Pamukkale and loved it – the terraces are so stunning!